It is funny how everyone would have called the double dribble on this play, but people here and all over the place were insisting that the play in the Wofford-Kentucky play was a double dribble as well, but many did not see the defender's foot, in that case, touch the ball and stop the dribble. I even had some people claim they could not see the play even after I blew it up in my video. Just ironic what people think they see after the fact. dribbler and defender are usually facing different directions, thus it's usually pretty easy to tell whose foot it hits by the direction the ball goes. When I'm the crew chief I make sure that we're putting the ball in play where it supposed to be. It's always part of my high school pregame. Put the ball in play where it goes out of bounds, or where the foul, or the violation, occurs. Just saw both plays. Don't know what I would do but the dribbling violation seemed like a fairly obvious dribble-fumble-dribble. But I knew what I was looking for and it was slo mo. The foul on the 3 point shot was very correct. It's only controversial to Auburn fans. In a perfect world, the C grabs this foul. What is the time on the clock on this play? Where is the ball put back into play? Not a jersey grab IMO. A jersey swipe? Yes, but not a grab. Plus, had nothing to do with the play, merely incidental. If a foul is called there, the whole world would be questioning it. IOW, the lesser of two evils prevailed, as it should have. I didn't think this was a foul. It was for a fraction of a second and didn't impact anything. Yep, that's what I've been saying. The contact before he picks up the dribble could have been called as a take-foul. And yes, I have called fouls from the Center in pressing situations when Trail is straight-lined. I mentor a kid who is still in college and we've had several conversations about the Center official helping out with contact in the back court. Last edited by Raymond; Sun Apr 07, 2019 at 01:17pm. You've got 2 guys looking at that backcourt double dribble, 2 angles, dual controls because you can afford it in that instance, part of the reason we have 3 officials. No excuse that neither get that obvious call. And thank goodness the lead in the last shot stepped up, because Sirmons, the trail there (primary?) and the C here (secondary but also critical dual control) wilted in the last few seconds of that game. Had the L not stepped up on the last play, it would have been the worst last few seconds in the history of a FF game. The thing with still pictures is the loss of perspective. From this still picture, yes this is a foul that the C should have called. The C, nor any other official, has the ability to stop frame a scene and see exactly what happened. It is very possible that 1 or 2 "frames" either way and there is not enough contact to make a call. The thing will humans is we see a lot, but we also miss a lot due to the speed of the game vs the speed of human vision. Then there is the entire angle issue. Obviously the C has a different view of this than the camera does, and from the C's position it may even be less contact than what is witnessed in this single frame of time. The missed DD is a bigger issue. The foul call on the 3 attempt was absolutely, 100% the correct call. If the defensive foul is anywhere in the frontcourt, the throw-in spot is determined by the line of demarcation–the closest 28-foot line or tickmark on the endline. Additionally, the shot clock is reset to a maximum of 20 seconds. If the foul is in the backcourt, the throw-in is at the nearest spot and the shot clock goes to 30. ...and doesn't reset if 20 plus. I too just saw them. The illegal dribble was pretty obvious. Tough one for two of them to miss. At least one had a perfectly clear look. The foul wouldn't have been called 10 years ago. It gets called now. It was a foul. 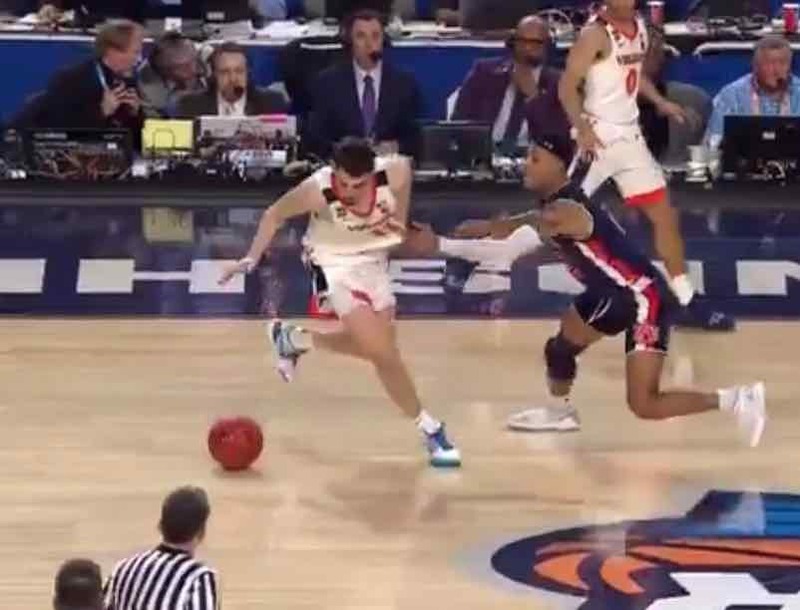 With the time remaining in the game at the time of the missed illegal dribble, it likely had a direct impact on the outcome. Not the first game this year where a last second missed violation likely changed the outcome. How about the missed take foul after the fumble but before the double dribble? I mean, if we're playing "what was missed" then everything should be on the table.